Today is going to be a short, general housekeeping post. Wine Wizard Bob recently held a couple of wine tasting back in the Boston area. As you might expect, given his recent travel to Africa, he chose to showcase SA wines. Here are a few notes. Biggest hits were the aforementioned Graham Beck Brut Rose Bubbly, the Raats Family Cabernet Franc and the not previously mentioned Rustenberg John X. Merriman. The Rustenberg was the 2003 vintage and is a classic Bordeaux style blend. It compares favorably to 2nd Growth Bordeaux at only $30 retail in Boston area. It does need to be decanted and allowed to breath for about an hour. They are so confident of the quality of their wine, that Rustenberg states on the back label, that the wine will benefit with 10-15 years of aging. WOW! When I visited them, they served a 1999 in magnum and it was a magnificent, but still youthful wine. If I could take one winery's portfolio, it would be Graham-Beck. I know I've raved about the Champagne, but that overlooks the sensational whites and reds. Virtually everything is priced in the $15 - $20 range. I realize it may be a little tough to find in certain parts of the country, but make a point of remembering the name and grab some when you come across it. I'm going through a withdrawal of painful proportions from lack of South African coffee and croissants, thank goodness I can get the wines. Jumanji! 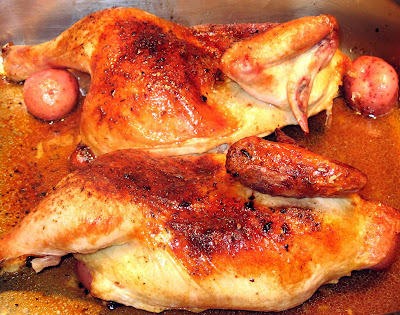 I recently made a roast chicken using the sauce recipe from Pork Roast All'Arancia. In some ways the meal was better with chicken than pork. Here's the recipe and a photo. Enjoy. Bring the chicken to room temperature and preheat the oven to 350 deg. Melt the butter in a pot, add the orange juice, orange rind, garlic, red pepper flakes and oregano. Rub the chicken with salt and pepper. Place the potatoes in the bottom of a dutch oven or roasting pan and drizzle, lightly, with olive oil. Put the chicken in the roasting pan in a single layer, covering the potatoes. Pour on the butter and juice mixture. Baste occasionally while roasting. Remove from the oven after 1 hour. Lightly cover the roast with foil and let rest for 10 - 15 minutes. Carve & serve. That is a nice looking bit of chicken there. I have had some South African wines in the past that I really enjoyed.